Nope. Just baking. Or non-baking really with this recipe. It’s been a long time since I’ve heard questions like those. I used to bake cakes just to see how many layers I could stack. Or because I was craving fudge frosting. That has certainly been rare recently. I knew in my own time I would get back to this place. It’s funny, this recipe was actually posted on my blog two years ago but I never made them. They were a fabulous guest post by a blogger friend. I was sad to realize she no longer posts and has left twitter…even sadder that I didn’t notice. But it’s the end of December so it’s time to celebrate. So cheers to finding a piece of you that you felt like you’ve forgotten. Cheers to all the bloggers, the creators, who have inspired me for over five years. Cheers to the holidays and celebrating all things sweet and joyful. 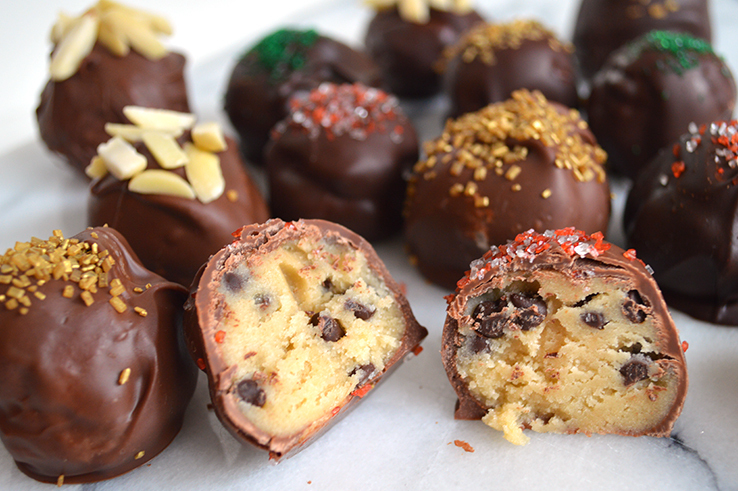 Cheers to making cookie dough covered in chocolate and dusted in gold. In a stand mixer fitted with the paddle attachment (or a large bowl with an electric mixer) cream together butter and sugars on low speed until fluffy. Add in milk and vanilla extract. Slowly incorporate flour, salt, and baking soda until fully combined. Add in chocolate chips. Cover dough and refrigerate until firm, about 1 hour. Once dough is firm, form 1″ balls and place on a wax/parchment paper lined baking sheet. 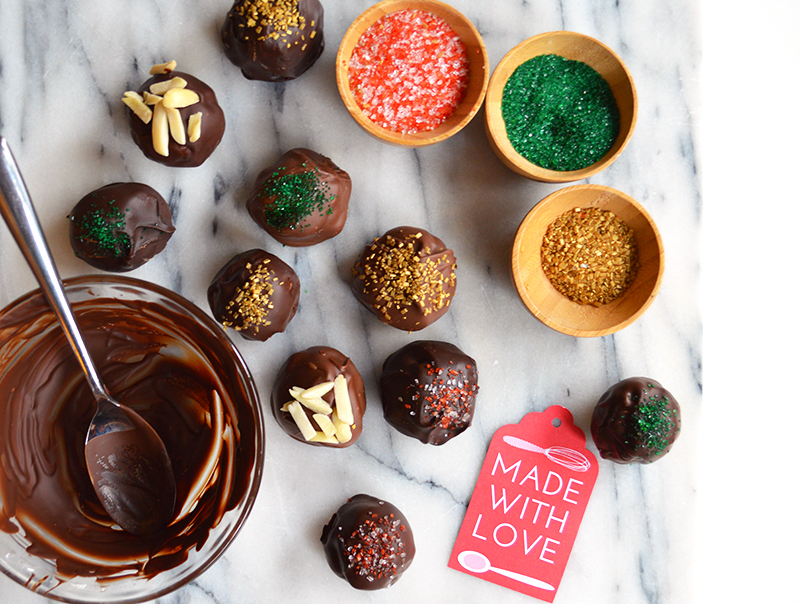 (I used a 1″ ice cream scooper at this step so all the truffles would be close in size. A tablespoon would work fine too). Place in the freezer until firm, about 30 minutes. In a glass or microwave safe bowl, melt any dipping chocolate (or extra chocolate chips) according to package directions. 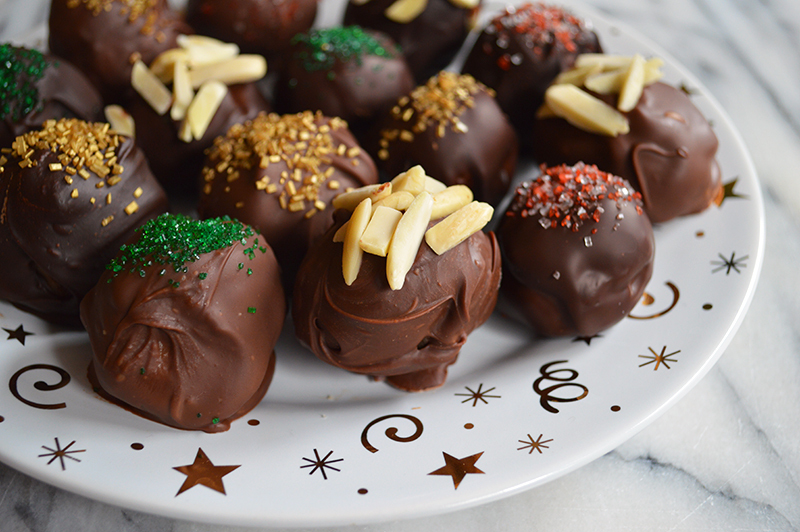 Using a spoon, dip frozen dough balls into chocolate and roll until fully covered. 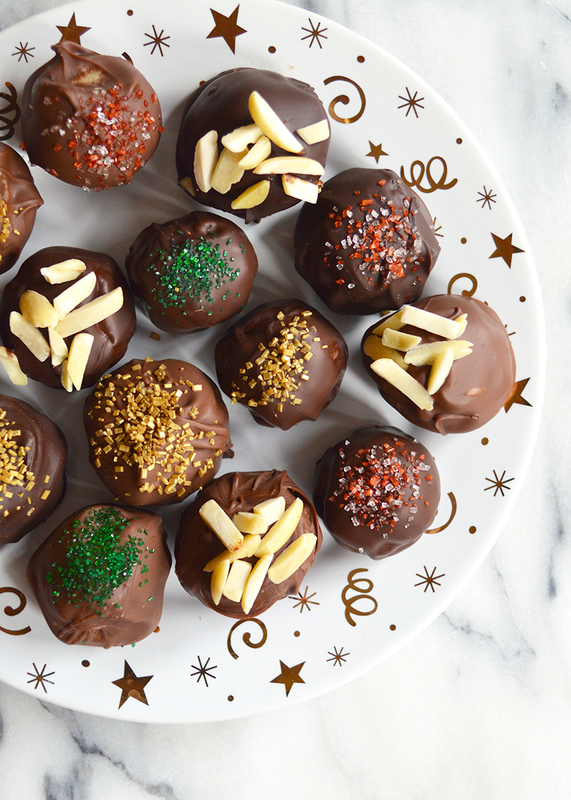 Place dipped truffles on a lined baking sheet to cool. Posted December 15, 2014 in Recipe by Nikki. These are so pretty, and I’m sure they taste delicious! I understand on baking and feeling like you’re slowly returning to parts of yourself . . . it’s been a while since I got my kitchen nice and frosty with flour and sugar, too. But with Christmas nearly here, it’s time. How many truffles does this recipe make? They look great! I have never been more upset to have had mouth surgery and be on a liquid diet because these look AMAZING!